The New Zealand kauri is a magnificent tree, one of the largest and longest growing trees in the world and the oldest in New Zealand, appearing here 20 million years ago. Tane Mahuta is the name given to the largest surviving kauri. 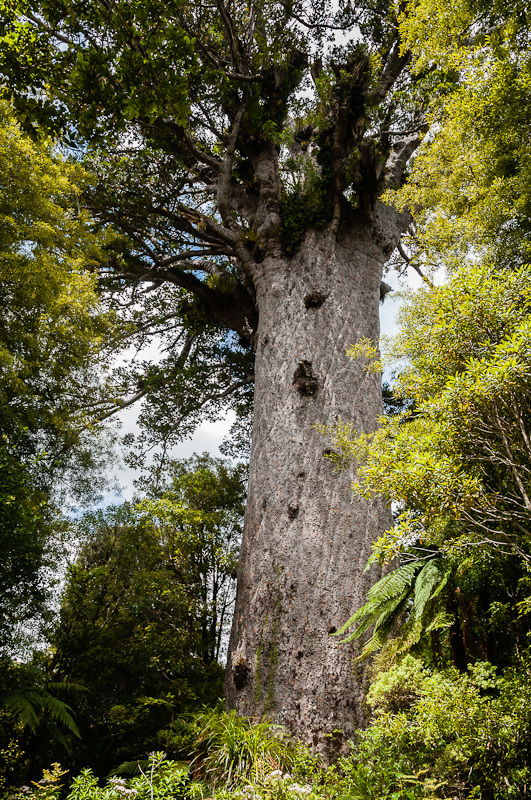 It is 45.2 metres tall, with a girth of 13.7 m. Its trunk is unbranched to 18 m. The oldest survivor, Te Matua Ngahere, is thought to be at least 2,000 years old. It is shorter and more squat with a height of 37.4 m and girth of 16.76m. Here is Tane Mahuta. Unfortunately I did not have a person in front of it for scale. To give some idea, the base of the tree is obscured by bush, and if you were able to get close you would be hidden by the plants in front. Kauri are slow growing trees, gradually dropping lower branches and changing from a conical to a columnar shape with a flattened mop of branches at the crown. Mature kauri crowns have huge branches which support an abundance of life with ferns, mosses, epiphytes and lianes. Below we see the view up a smaller tree than Tane Mahuta. It gives a limited idea of the scale of life supported by the crown. People who study the ecosystems in the crowns need the skills of arborists and a head for heights. There is a lot of life up there. But the future of the kauri is uncertain. 4 million acres of forest were here. They have been reduced to 18,000 acres of forest with the vast majority of those trees having been felled or destroyed by European settlers from 1820 on, with surges of such destruction occurring in the late 1800's and 1920's to 30's. Even as recently as the 1960's the government was facilitating logging of pristine kauri forest. The wood is fine grained, hard, and beautiful. Because the trunks are straight and unbranched to a considerable height, kauri were valued for use as masts and spars for sailing ships. You would think that such special timber would be valued. But it was wanton destruction - about half of the enormous volume of timber from the felled trees was burned. Now the kauri is threatened by kauri dieback a disease specific to New Zealand kauri, caused by Phytophthora agathidicida. It kills kauri trees, and it is untreatable and spreading. What are we doing? On one hand there are efforts to stop further spread of the disease - eg protection of the vulnerable roots around those trees that we visit to admire, special walkways and stations for cleaning shoes to stop the spread of the infection. And on the other hand, there has been a weakening of the law that identifies trees that should be protected. So an apparently healthy urban kauri growing in an area where dieback is present had no protection when the people who bought the land on which it grew sought permission to fell it and other substantial trees, in order to build a house. If it has resisted dieback it is very precious and may help the fight against the disease. Too bad - concern and protest and occupation by tree-sitters delayed but did not stop the destructive intent of these people. It has been ring-barked - a cruel injury which means there is little chance that it will survive. So, wasteful colonial attitudes do seem to persist to this day. And a government which removes protections previously in place for such trees seems like a blast from the past too. We are so small - on this walk in Waipoua Forest it is the smaller trees and understory that dwarf the walkers. And yet our carelessness and lack of foresight might mean we lose this taonga (treasure), the kauri. We humans are a puzzling lot.